When I heard Frances was having an artificial knee implanted on the Friday before the clinic, I thought “Come on sunshine… there’s no way you can be OK to be here only 6 days later.” That’s a surgery that takes a year to recover from according to what the orthopaedic specialist told my friend who is lining up for one soon. The swelling and pain is abysmal for weeks and weeks. We’re talking about leg bone cut off in two places and titanium and plastic anchored into the severed bone. All that week, in my own personal journey, I had been working on feeling and being “limitless” and in that context it occurred to me that I was limiting Frances’s healing with those thoughts – so I chose not to do that and allowed her to come. At the end of the first day, she had overdone it a bit and I lay across her bed putting my healing hands on her while she worked her way through stuff that was limiting her own healing. We were both flabbergasted as we watched weird flutterings under her skin and then the swelling in her leg (which was astronomical) went almost completely down under our very eyes. It came to be a bit of a nightly ritual for me to lay across her bed companionably and chat about our awesome days, while the healing accelerated so dramatically as she daily cleared any limitation to her healing. Clearing this stuff increased her access to her own inner wisdom and Frances was a seriously fabulous contributor to everyone else’s progress in the clinic. Suze found a new liberation in her body in our morning walk/runs that she hadn’t felt since before she had children and through that experience in her own body, improved her own riding seat too (which is exactly the purpose behind the simulations on our morning walk/runs). Susie helped Solnar to transform from a weaving nervous wreck into a relaxed horse.m He stopped weaving just minutes before this photo. After Susie patiently helping him to release saddle and other issues, Solnar started to find self carriage fairly quickly. Her recently bought horse Solnar arrived a windsucking, pacing, weaving from side to side, nervous wreck and made an enormous relaxation breakthrough, I think it was the afternoon of Day 2. 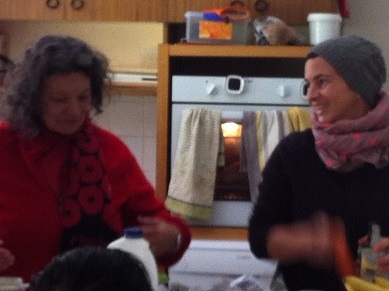 That was the last we saw of the weaving. Then we watched Suze slowly and patiently lay every step of preparing to ride and then riding, into Solnar’s relaxation. He even found a naturally elevated back in self carriage by the end of the week. OMGoodness that horse can move beautifully. What a star! Peppi with Cam in what we jokingly call “the picnic table” – where horses and people both, can find a new level of relaxation together as a foundation for everything else that they do. 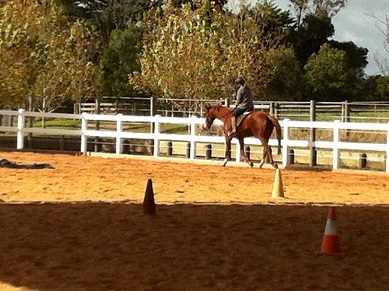 At 12 years old, Cam was not our youngest participant ever in a clinic, but close to it. 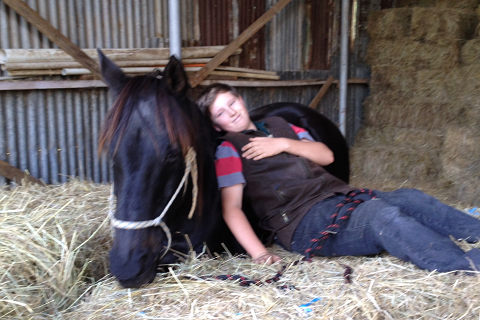 This sensitive young man got to understand that his sensitivity was a gift to help him with his love of animals and his ability to facilitate healing for them, not the burden that he had been thinking before. And crikey this kid is some “healer” and with all that beautiful sensitivity he’s going to make a seriously wonderful adult. 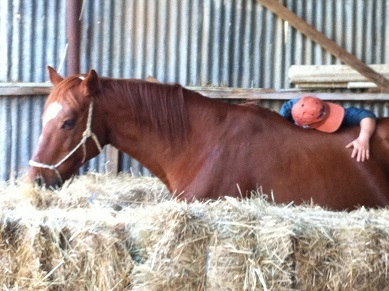 Like Cam, this Sue was fence-sitting, with her horses back in their paddocks in New South Wales. She too arrived having been unwell for months, with doctors results from invasive tests pending over the next week or so. The combination of raiding my sauerkraut jar at every opportunity and the emotional stress relief that is part and parcel of our clinics, seemed to do the trick and she was in good health by the third day. She discovered a confidence in her sensitivity and how to use it, both to facilitate healing with her horses and to accelerate her riding ability (she was already a pretty good rider by most standards!) and she gained a new confidence in herself with people too. Here’s an excerpt from her email to me after she got home. I am also taking him on my morning walk which I have decided to continue with after I found it so beneficial on the course. Unfortunately no matter which direction we head we have some pretty hefty hills to climb but we started short and have extended a bit each day. Today I decided to have a go at introducing the saddle ( he hasn’t had anything on his back to date) using the slow and gentle method so ably demonstrated by Suze and her horse. Thought we might have to plonk it in the middle of the paddock and simply stop beside it now and again initially, but he was fine with the smelling and so relaxed that we continued on and actually got the pad and saddle on his back and done up on the first day. The plan is to put it on before we go for our daily walk. Reuben the spooky , trembly abused fellow was very happy to see me when I arrived home and hadn’t regressed at all, touching base with him on a daily basis during the clinic certainly worked a treat. Now you have sorted out my heart feel and shown me how to use the third eye instead of going in to overwhelm, it is much easier to understand what he is saying and feeling and the layers are just falling away. Still a long way to go but he is sooooo grateful to be given the time and attention. We have had some hilarious fun in the home paddock, with the other horses watching on in amazement! This is the horse who does everything at speed, so of course the first time I got on, he took off around the paddock at a hundred miles an hour. However by the end of the session he understood that there was no urgency and was able to walk at a reasonable pace and slow down and eventually stop when I back pedaled! Back to Sue: The second session he had the walk and stop down pat but we were wandering around where ever. A way to go with this one but I am very pleased with the way I handled his rebellion, if I had had reins or a chest strap I would have picked them up and steered him to the right but without them I had to rethink everything and come up with alternatives. Today I rode with a dressage whip and used it like a rudder at his back end without actually having to touch him, he was only too happy to move his bum away from the rudder thus giving me the turn. What a blast, we are both having a ball. Thank you Jenny and everyone else who contributed to the clinic. The lovely energy that Haruko developed so fast with Bobby, was a credit to her. 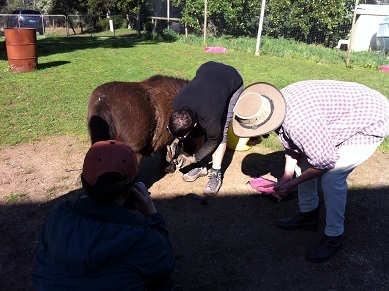 Haruko working on her seat in the Grazing Exercise with Ron. 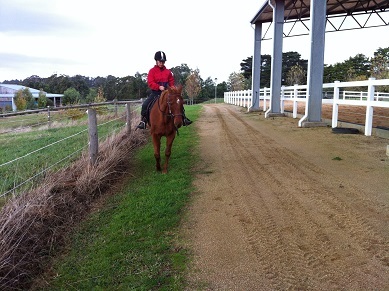 Haruko & Ron on her first ride outside an arena. Haruko had two horses for the clinic and her extra week of private lessons after the clinic – my Bobby and Sue’s lovely old boy Ron. Thanks guys for being such wise teachers! She found her magnetized seat and learned how to keep that lovely seat for turning and emergency stops. She learned how to teach her green horse at home how to do stunningly smooth and beautifully seat anchored backups and turns, developed a great grazing game, helped Ron release an old trauma around the mounting block and really settled into using her early warning signal that something was Not Quite Right while she was at it and then had her first mini trail ride outside an arena ever. She also discovered that to use her very Japanese’ness with her horse was a powerful thing to do. In fact, it seems my horses even speak Japanese! Haruko arrived a very keen student grasping every bit of knowledge she could get with both hands and left behind a heap of Aussie friends, specially me. Even though I was sick for that last week, I very much enjoyed her wise company and loved all the Japanese food that she introduced me to that is sooo… good for the digestion. Thanks Haruko! Haruko came back this week with these comments to share. I have been thinking how/what I should tell about our clinic. Since it was so wholistic and multiple, it is difficult for me to summarise into sentences. You are really a genious, hidden in Rokeby. Yesterday I visited Maru for the first time after my coming home. She looked a bit sad from a distance and was very glad to find me again. We had a lo~~~~~~ng big hug again and again. On Day 1, we saw Sue apply world class horsemanship to her work with Phantom getting a new sensitivity and depth to motivating this task master horse – simply beautiful. 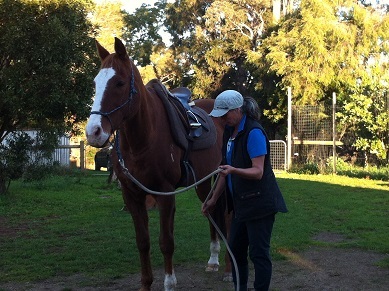 Although Sue had all kinds of “couldn’t be helped” interruptions to her clinic, she reports that she found a new level of riding ability from our morning walk/runs, where we worked on getting our own bodies into the self carriage that we are looking for from the horse – in all kinds of situations, including transitions from walk to trot, shoulder in’s, and gathering our bodies into a more powerful place that works sooo… well for carrying those of us who are a bit taller (like Sue) or a bit heavier (like me) than others. She also had her first ever completely bridle-less ride on Ron, a wonderful wise teacher who offered up this gift of confidence to her. Tamara tells me that she hadn’t walked like we walked/ran in our morning walks in years, specially because she had weak, problem ankles. 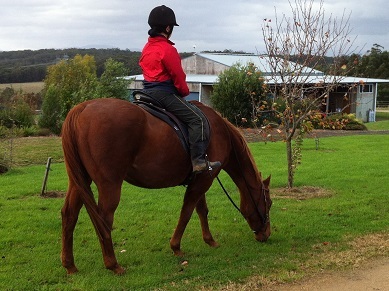 It was lovely to see Tamara get a confidence in her body as she looked for and found the self carriage in her own body – in walk to trot, shoulder in, half pass and other manoeuvres, as she was dancing her way smoothly up and down the bush track. She also learned how to stop an asthma attack using dramatically less drugs than she is used to. I look forward to hearing more about that progress please Tamara. Kristina demonstrating how she uses her connection skills in a complicated feet trim. Ahh Kristina – thank you Kristina! I loved having you back here again, even if it was only for a couple of weeks, your support at this busy time made it possible for me to enjoy every bit of my clinic too. For those who don’t know her, Kristina was a working student here for most of last year and knows me, the horses and their routines. I have a vivid picture from the clinic of this vibrant young woman coming dancing into the kitchen early in the morning, all flushed from her morning run (much longer than ours), a shining picture of good health and sooo… good at listening to her body while she cleans up the last tiny vestiges of her childhood illness. That is VERY far from the girl who limped into my house a bit over a year ago, with swollen joints and withered muscles from the arthritis that she had had since she was a small child. I stepped up into a new level of facilitating healing, for myself first and then for others, just before this clinic and gained a new or deeper understanding of that connection between horsemanship and feelings of well being and healing for both horse and rider – and how all of this is intricately woven together into good horsemanship. Bring on the next clinic! What heights can we get up to next I wonder? So true, as you know I stopped riding my horse for a while before the clinic, inconvenient as that was because it all felt so wrong both to me and to the horse. When I climbed aboard on my return the enjoyment was back, we both felt balanced and as one . Think the horse was just as relieved as I was! You will be pleased to know that I have some homemade sauerkraut fermenting on my kitchen bench. Life is just not the same without it . Looking forward to September and all that it brings. Hope to see you September in Nowra. I did enjoy reading this blog. It reminds me our clinic so vividly! I miss my people in there. Funny, I did not know that I had a walking problem…,though. Glad that is OOOver ! Ahhh 🙂 It’s funny how we don’t know how much better we can feel until we do, hey?